Lately I’ve been on a bread baking kick. I’m determined to keep trying recipes until I come up with a few that I feel are my ‘old standbys’. I don’t like reading ingredients on store bought bread like ‘mono + digi steroids of fatty acids’, or something like that! eww…shudder! Remember the more you bake the quicker you get at it. I especially want to find that perfect whole wheat recipe that uses mostly whole wheat flour and not white, it’s hard to do. I’ve baked a few loaves already that though they tasted great, they didn’t rise up as nicely as I’d have liked. This one seems to be a good one! I’ll try it as a loaf next time. All golden brown and crispy! This recipe is from Hodgson Mills but I changed the amount of wheat gluten and went more by what the ‘Vital Wheat Gluten’ box suggested. I made half a recipe to test it, you’ll see I put the recipe here in half (one loaf like mine) and double. You don’t have to braid it but isn’t it COOL? Try it, impress your family! If you notice there’s a few spots that looked pinched, that’s where the towel stuck a bit after the second rise. I learned, don’t use a towel! Use plastic wrap sprayed with oil on second rise. Also it’s a bit darker than I’d like, I put it in for recommended time and had a workman here distracting me so it was a little darker than I’d like. But it is fine and very nice and crispy when you cut it…oh yummy! * My Notes: I altered the amount of vital wheat gluten the original recipe called for. Also I mixed this by hand. 2 1/4 tsp active dry yeast – MEASURE the YEAST! I found there wasn’t the right amount in one package, go by measuring it! You may need two pkgs to get what you need. 1. Measure yeast into a large bowl, make sure bowl is not cold. Add the warm water and stir to get wet and dissolve. Let it develop 10 min. while you mix next step. 2. Mix in the bowl you’ll let the dough rise in (just so we don’t mess up too many bowls): brown sugar, wheat gluten and wheat flour. Make sure there are no little hard lumps of sugar, just mix it around with your fingers. If your flour is cold from being in the fridge or the house is cold, put this bowl of mixture right in a warmed oven to take the chill off. NOT a hot oven, turn it to warm, let it warm up then turn it off…put bowl in. 3. Add oil and salt and mix it in well. 4. Add 1 c white bread flour and beat well, work in enough of the remaining flour to make a soft dough, not sticky. Do all this in the bowl, you can use your bowl scraper and push flour into the dough, then use your hand, use a kneading motion to work flour in. 5. Turn onto floured counter and knead 6-8 minutes, or until smooth and elastic. Time to meditate. Take that bowl you used to mix flour in and wipe it out, oil it and put the dough in it. Roll the ball around to get it oily then use your hands to make sure it’s oiled. Leave in bowl, covered with a slightly damp tea towel and let it rise in a warm place. I like to warm the oven, turn it off and let it cool a bit then put it in. Close the door only if it seems cool enough, if still pretty warm don’t close it. Set your alarm for one hour and let rise (or until it doubles). Wash your dishes now and if your smart, get a family member who wants the honor of punching the dough down, to wash them for you! 6. Punch dough down. Plop out on counter and pat it out to push gas out of dough. a. I patted it into a circle like a pizza, then with a really large knife just cut into thirds like a peace sign. b. Take each section and pat it out more into a long shape then roll it so it forms a thick rope. Pinch the seam and now roll it more on the counter, to make it stretch longer. Mine ended up about 18″ long. Do this with all three, it’s not hard, really! It’s like playing with play-dough! c. Lay them side by side on the floured cookie sheet and at one end pinch together and sort of tuck it under so it looks nice. d. Now braid it like hair…ahmm…I braid my hair every day but doing it on something else can be confusing (it did me!) so don’t give up. Just pick up one outside rope and cross it over the center one. Now pick up other outside rope and cross over the ‘new’ middle one. Keep repeating. If there’s a tiny bit of flour on them and your hands they won’t stick and you can keep rearranging them till you ‘get it’. e. At the end just pinch together and tuck under. Now look how COOL that looks!!! 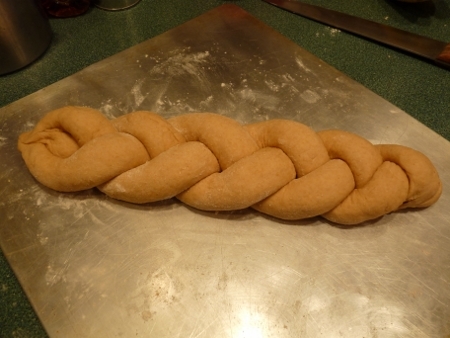 Braided and ready for the second rise! If you’re putting it in a loaf tin just pat it out into a rectangle shape then roll up, pinch seam and ends to seal and put in greased loaf tin. 7. Cover with plastic wrap (towel can stick to dough now) that you spray with oil, just enough to keep it from sticking. Let it rise again (back in the oven) about 45 min or until nearly doubled. * If you like, when you make your roll, dampen with water then roll it in oats or seeds before putting in tin or on cookie sheet, they stick, look nice and the family will think you’ve turned pro! 8. Carefully take out of oven (if that’s where you let it rise!) and leave covered while you pre-heat your oven to 400 degrees F. Uncover dough and bake 30 min. (Directions say 35 and this was too much, so keep an eye on it at the end) Done when it’s golden brown and sounds hollow when tapped. Let cool on wire rack, don’t cool in the tin. 1. Measure the yeast into a large bowl. Add 2 c warm water and stir to get wet and dissolve. Let it develop 10 min. while you mix next step. 2. Mix in another bowl, brown sugar, wheat gluten and wheat flour. Add this mixture to the yeast mixture and beat for 200 strokes! 4. Add 2 c white bread flour and beat well, work in enough of the remaining flour to make a soft dough, not sticky. 5. Turn onto floured counter and knead 6-8 minutes, or until smooth and elastic. Take bowl you used to mix flour in, wipe it out, oil it and put the dough in it. Roll the ball around to get it oily then use your hands to make sure it’s oiled. Leave in bowl, covered with a slightly damp tea towel and let it rise in a warm place. 6. Punch dough down and divide in half. 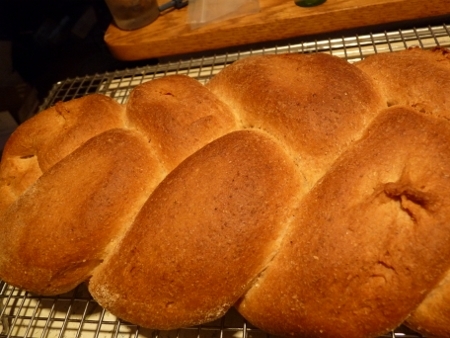 Form each into a loaf or round by first pushing out on counter to push gas out of dough, then roll up. Put in greased loaf tin or for a round or shaped loaf put on cookie sheet dusted liberally with flour. Cover with plastic wrap that you spray with oil, just enough to keep it from sticking. Let it rise again (back in the oven) about 45 min or until nearly doubled. * If you like, dampen dough with water then roll it in oats or seeds before putting in tin or on cookie sheet. 7. Carefully take out of oven (if that’s where you let it rise!) and leave covered while you pre-heat your oven to 400 degrees F. Uncover dough and bake 30-35 min. or until top is golden brown. Done when it comes out of tin easily and sounds hollow when tapped. Let cool on wire rack, don’t cool in the tin. I hope you try it and let me know how it goes for you. 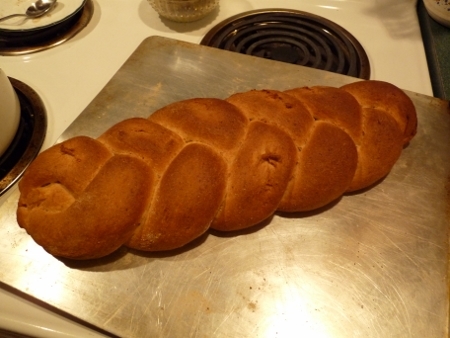 I’m still learning how to bake good yeast bread and would love to compare notes.